Zupee is an android live trivia & quiz app where you can win real cash by answering questions. There are two variants of this app: 1. Zupee and 2. Zupee Gold. You can download Zupee from the Google Play Store but the Gold version is only available at zupee.in. The difference between the two apps is that on Zupee you’ll only find free quiz tournaments while on Zupee Gold there are both paid and free tournaments. 1. Download the Zupee Gold app from here. 4. You'll get two tickets. 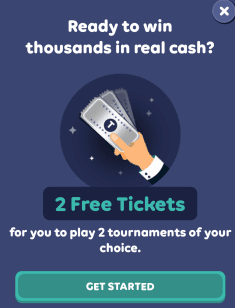 You can use these tickets to join paid tournaments for free. 5. Go to Profile section and submit your Paytm number. 7. Submit and you'll get Rs. 5. 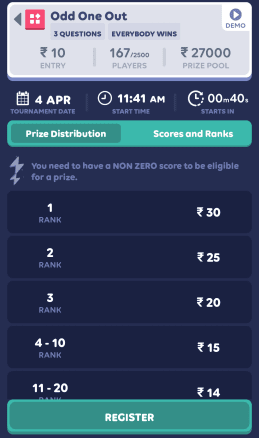 Tournaments on Zupee app are free to join. These tournaments have 3-7 questions which you need to answer correctly as fast as possible. The faster your response the higher your score. There are also sports-prediction tournaments. The questions in these types of tournaments are about the things that can happen in the match. Once you select a tournament you can view information like, start time, prize distribution, players, prize pool, etc. To join the selected tournament hit the Register button at the bottom. You can play the quiz when the timer hits zero. On Zupee you can play tournaments on topics like geography, Bollywood, sports, maths, English, comics and more. Tournaments on Zupee Gold are the same as Zupee. The difference is that these are paid tournaments. You need to deposit cash from your Paytm wallet to join. You can also play tournaments with tickets that you get on sign up. The prize pool of tournaments on Zupee Gold is bigger. 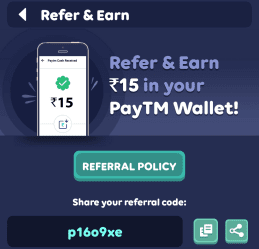 You can earn more Paytm cash from Zupee by sharing your referral code with your friends. When your friends enter your referral code in the Zupee Gold app you they get Rs. 5. You will also get 3 tickets for every referral. You can also earn by submitting questions across various categories. 1. To submit question go to Question Factory section in the app and tap Add. 2. Select the topic in which you want to submit questions. 3. Enter the Question and options. The correct option should be in the green bracket.